'Concatenate' is computer terminology, and is from the same source word. However in matters of the English language, it is an erroneous concoction. The word 'catenate' as a verb, would suffice. The prefix 'con' meaning 'join' is unneceessary. The verb 'catenate' simply means to 'string together'. The Maerklin model catenary system is functional and elegant. It is also very robust. You might approach the set up of such overhead wiring with some trepidation, but allow for time, and patience. Leave space for your hands and fingers against walls or other obstructions during set-up. My first recommendation is to use the mast positioning jig set 70011, as this will consistently place your masts correctly for installation, and save lots of running problems. Secondly, commence your catenary set-up at the end of the switch blades of a turnout. This will minimize the number of adjustment sections 70231 you will undoubtedly require as you come across more turnouts and crossings. Thirdly, for masts on curves, use a number greater than recommended by Marklin, if you can afford it. In other words, use shorter catenary lengths as it makes for less troublesome operation. 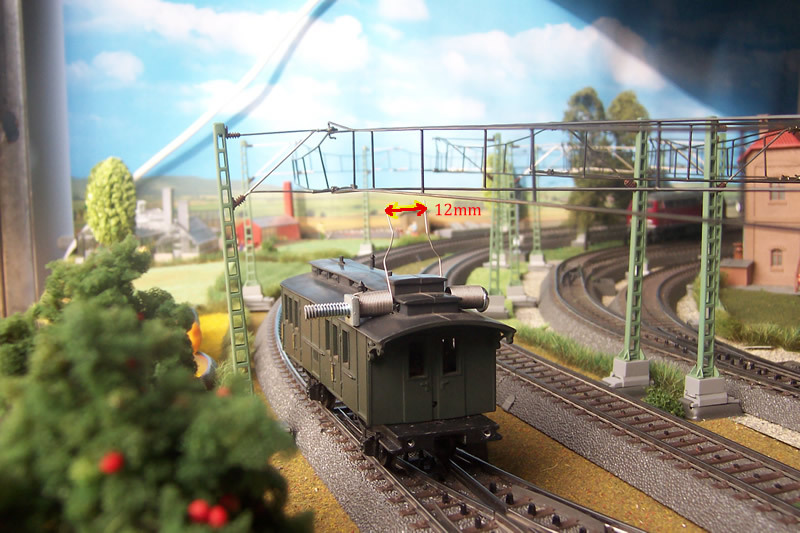 The Marklin catenary masts are supplied with a sheet metal clip (base with holding tongue) which fits and holds purposefully under C track road bed. At widened track bed at turnouts and crossings, I simply broke off the holding tongue and used the metal base. Or you could just as easily straighten the end of the metal holding tongue, and secure the mast by a screw at the other end. The straightened tongue would help to hold it vertical. The mast has a plastic base which simply slides into the metal base, and it is this plastic part that has a countersunk hole for securing with a screw. The 70131 is a specially built box section catenary wire to cover double slips and crossovers. While I used it to cover the 24620 slip and 24640 crossing, I assume it would be suitable for the 24740 long crossing and the 24649 short crossing. Marklin state that for each of the four legs of the wire, you require a 70231 adjustment wire. This is no longer correct, nor necessary. The 70131 as currently supplied (2009) includes adjustment guides built in to each of the four legs of wire. When setting up the catenary routes, I found the 70011 mast positioning jig, very useful and because of its accuracy, I highly recommend it. Without it, I placed masts at a running error of up to 10mm, and this makes for horrible running consequences. I also built a special car called a wire positioning car. This was built up from a discarded covered vehicle, and the principal of construction can be seen from the photographs. Basically, the catenary wire must run within a 12mm band, that is it can deviate up to 6mm either side of the track centreline. This allows for the narrowest Marklin pantograph pick-up. I got an older wagon with a warped plastic body which didn't mind being modified, and relished the idea of having a working life instead of being stuck in a box. The pictures show how I used a metal screw, with springs to act as rabbit ears under the wire. I used a weak spring so that if they fouled the horizontal stay on the mast, they would simply slide under and rebound to their correct position. The springs must be installed directly above one of the car axles, to be positioned correctly as a guide. The springs came from old printer ribbon casing. Similar springs would be available commercially, but you might have to buy a thousand of them.